From the “Making dreams come true” department, we recently had a sauna installed at the new gaff. It’s very nice, and you should know that South Eastern trains have a special, hidden, weekend fare that lets you use the High Speed service for the same price as the slow train, and that I can pick you up from the station. 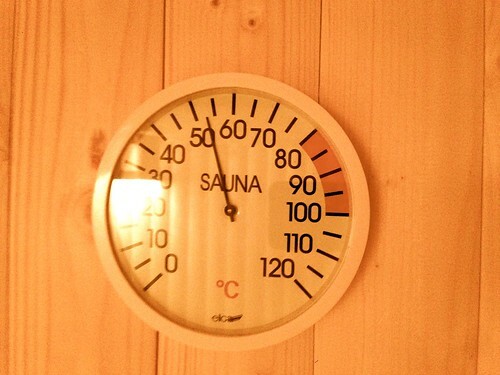 In related news, Reuters reports that saunas “might” be good for one’s health. Reading on, this headline seems to undersell things a bit. I’ve always thought that mortality was more or less 100%. Everybody dies, sooner or later. Now, Elijah skewed the stats a little, but his non-death was compensated for by Tabitha, Lazarus, and two or three others; but on average (and certainly within experimental error), we’re good. But according to Reuters, that absolute statistic is looking somewhat shaky. So you might want to take me up on that offer from Gravesend station. Sadly, I can’t tell you how sound are the data linking saunas and immortality, because I don’t have access to the paper. This entry was posted in Me, Nonsense and tagged immortality, sauna. Bookmark the permalink. I always thought that cancer cells were immortal (at least the HeLa line is still going strong), so in principle immortality is possible, if not necessarily desirable for the good of the species. I guess the Reuters’ journalists misunderstood deaths from all causes, as dying at all. And oh yeah—do you think Enoch took saunas too?